The 3020 RF signal generator together with the 3010 RF synthesizer form a compact precision digital RF signal generator occupying just three slots in a 3U PXI chassis. For the first time, system engineers can fully integrate RF source requirements into their PXI test systems and by doing so, save space, cost and improve system performance. 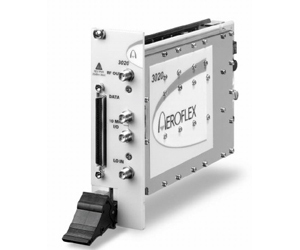 The 3020 brings high performance signal generation to the PXI environment, reducing the dependency on conventional instrumentation to provide RF signals. The versatile two-slot wide 3020 RF signal generator produces IQ modulated or CW signals between 250 MHz and 2.5 GHz with an IQ bandwidth of up to 14 MHz. The 3020 accepts a low noise, agile local oscillator input from the 3010 / 3011 RF Synthesizer module. The performance of the 3020 RF signal generator makes it ideal for generating the complex modulated signals for digital radio communications test applications. Modulation linearity for UMTS W-CDMA signals is better than 55dB—a comfortable test margin for measuring mobile transmitters. The 3020’s level accuracy, repeatability and switching speed make it a tough act to follow for high-volume automated production test. The internal arbitrary waveform generator (AWG) has a capacity of 32 Msamples. This flexible AWG can be used to store either a single long waveform or a collection of smaller waveforms up to the limit of the sample memory. Transfer of waveforms between the controller and the AWG is fast by virtue of the wide bandwidth of the PXI backplane. For real-time measurement or system emulation applications, the 3020 RF signal generator supports a LVDS digital IQ interface. Digital IQ samples can be directly modulated onto the RF carrier. By preserving the waveform information as digital IQ data, no analog impairments are added to compromise signal quality. The 3020 RF signal generator is supported by optional software applications for waveform design for common radio systems such as GSM, EDGE, UMTS, IS136, IS95, cdma2000 and WLAN as well as custom waveforms for FSK, PSK and QAM modulation types.